To all my friends in the HET Club, I bid you fond farewell. Sing no sad songs for me for I had a wonderful life. Think only of the memories of sunny days at countless meets when we walked and talked among rows of shiny HET cars. I am happy I got to know as many of you as I did, I regret the many I did not get to meet, but I did read in the WTN the friendships formed, so that must suffice. I thank you now for all the honors bestowed on me as club founder. The Essex and I were introduced to the world in the same year 1919. But the Essex had bad luck and only lasted 13 years. I have done a lot better than that, because we started the HET club when we did (1959), many of those cars have been restored and now will outlast me. 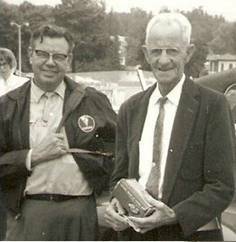 Keep in mind none of this would have happened if Roy Chapin had not met Howard Coffin and left Ranson E. Olds to start the Hudson Motor Car Company many years ago. So when you walk and talk through rows of HET cars in years to come, be thankful for the thousands of members who have worked so hard, in so many ways, so that we all can continue to make new friendships. I will be there enjoying your happy talk, and I will be happy too. His brother tried to get him to buy another Chevy, but my dad fell in love with a low mileage 1929 Essex Sedan. It had blue fenders with matching blue mohair upholstery. At that time a car without black fenders was unheard of, but Essex had “color tone” styling with 225 possible combinations. Fortunately the next day we went back to the dealership and bought the Essex. It was three years old with low mileage, in mint condition, and we paid $125.00. After four brand new Pontiacs, a used Studebaker and Chevy this car was a revelation. What a thrill to go up a hill in high gear and even pass other cars. We had no idea that any brakes could stop a car going downhill with five passengers and the riding quality of the “rocking chair springs” made us feel like the Mellons or Rockefellers of Pittsburgh. That car took us through five years of the depression and 50,000 miles at a total repair cost of only $10.00. When we traded it in, it was running just as good as the day it was purchased. The car would start in any weather and we often pushed the neighbors’ later model cars; we could run it without antifreeze, which was expensive at the time, by judicious use of the radiator shutters and draining the water overnight. I learned to drive on that Essex when it had 70,000 miles, and naturally I enjoyed the smooth oil clutch, easy steering, and braking. As soon as I saved $25.00 I bought a 1927 Sedan and I stayed with HET products all my life. Jon: What gave you the idea to start the club? Meritt: I had been a member of the Antique Auto Club (of America) for eight or ten years and I was very unhappy at how my ’29 Essex roadster (which I thought was a great car) was treated at their meets. I started restoring it in ’57 and it took me two years to do it. By the time I got done with it Bob Johnson over in Orlando and Bill Sturm and several others that I’d been writing to for years said, “Hudson’s out of business – we ought to start a club.” Bob Johnson of Orlando said he had a mimeograph machine available where he worked and he said “Well, let’s do it!” He said, “You do the first page with your comments and I’ll do the ads.” That’s how it got started. That was early or mid 1959. Our first issue went out October 1959. Jon: Who were some of the other Hudson enthusiasts who helped you get the Club off the ground? Meritt: Bill Sturm, Ken Krueger, and Harold Everett. We all really loved Hudsons. Jon: How about Doc Dougherty? Meritt: I didn’t meet Doc until a little while after I started the Club. Fred Long was one of the first members; I knew him. I bought my ’29 Essex roadster in New Jersey. I stopped at Fred Long’s house in Washington. Well, Fred never thought to tell Doc Daugherty about the Club, so the Club had started about five or six months before Doc knew it. He said if he’d have known there was a Hudson meet down in Natural Bridge he’d have been there if he’d had to walk. And he would have too! He really loved this club. Jon: Were there any problems for the club in the early years? Meritt: The first five years of the Club (when I was president) went very smoothly. I don’t know if nobody dared cross me or what! But when Doc got in there, there started to be little problems here and there about things, and I was always so happy that he was a good businessman and he was firm, and he stood by his thoughts on things. Jon: What were the circumstances surrounding the establishment of the rival T.H.E. Greater Super Six Club by Carl Horton in late 1966? Meritt: The worst problem we had was when a group in Indianapolis wanted to have judging. We had a national meet at their place one time in 1966. We worked with them to do it. But they had trophies for everything possible and the trophy (presentations) at the national meet ran on until almost midnight! I think they got their fill of trophies that night! I hated to hurt anybody’s feelings, but I was hoping they wouldn’t bring about judging within our HET Club. I don’t know how long they lasted. They had some wonderful things in their bulletins. I bought a few at a flea market one time. They had a lot of interesting things that we never had in the White Triangle News. Then there was another (club) in Texas that tried to start, but we (the HET) were on the ground floor. Jon: Did you come up with the Club's mission philosophy immediately? Meritt: No, that evolved over a period of time. For the most part, the way we wanted the Club to be was similar to the way a fellow in Pennsylvania started a four-cylinder Plymouth Club. He eventually got nosed out. He lost his club; somebody else took it over. He helped me get started on what he was doing and it was a good start on putting bulletins out and writing articles. But then when we had our first meet in 1960 at Natural Bridge, Virginia, almost everybody there – I think nineteen members – almost every one of us was a member of AACA and I don’t think there was anybody that said, “Let’s have judging in a one-car club.” They were all adamant that we do not have judging in a one-car club. I have been so thankful that they stuck to it and really did it. The reason I’m so happy about that particular item is that I always felt like Hudson was a very unusual vehicle compared to other makes of cars on the road, so I am happy that our club is a very unusual club. Jon: What has the HET Club meant to you and Elma over the years? 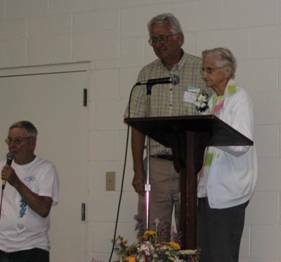 Meritt: It has been a big mainstay in our lives. Even though we couldn’t afford to go to all the meets, which we certainly wish we could have, it has brought us much happiness and pleasure. The people have always been so wonderful to us; treated us royally wherever we went. Jon: When you began the Club did you foresee the extent to which people are modifying and street-rodding Hudsons nowadays? What is your opinion of this? Meritt: No, I didn’t. That’s been an unusual thing that happened over the years, but I can certainly understand it! I’m tickled when they keep these cars as original looking as possible, but put the modern running gear in them for safety. I am here to express my appreciation of Hudson wives. For years I have seen you selling parts at the Flea Market, polishing cars at the meets, providing for hungry HET men, serving well as officers of the Club, hosting Club Meets. Thanks. I asked several Hudson wives if they knew their husband collected cars before they were married and they said, “Yes,” but they married them anyway. My daughter really thought her father was the only Hudson defender, so you can imagine her surprise at the first meet at Natural Bridge where there were lots of men who spoke Hudson and wives who supported them. One great thing about this hobby, you know where your husband is—in the garage with his head under the hood or under the car with just his feet showing. Before KGap there were junkyards. Wives spent a lot of time outside junk yards while husbands searched for parts—and sometimes bought a car which had to be towed home, and no matter if you are the tow-er or the tow-ee we never seem to get it right, “too far to the left, watch the fender” (which was already dinged by the previous owner). I never thought I would be happy to have teenage boys with drivers' licenses, but it was an opportunity to say, “Why don't you help your father bring home that Hudson? You'll enjoy it. Great male bonding.” What did I get? One son who owns nine Hudsons and one that hasn't driven a Hudson since high school. In 1958 he wanted to buy a 1929 Essex because he learned to drive on a 1929 Essex, which evidently is a legitimate reason for purchasing one. He had other cars, he repaired them, enjoyed them, and sold them. But the Essex was different, he was going to restore it. It had no top, dented fenders, peeling paint, and no upholstery, but not to worry, he was going to restore it. I learned a lot about automobile restoration from that decision. One-there are numerous problems involved. Two-cars are stored in the garage, the family car is outside. Three-husbands are usually in the garage under the car. Four-restorations are never completely completed. Nash there was panic among the Hudson owners. Where would they get parts to keep their cars on the road? They decided forming a club would be the ultimate solution. I learned a lot about car clubs from that decision. He published the bulletin, I typed it. He planned the meets, I made the arrangements. He drove in parades, I polished the car. I am glad that the Eastern Region has chosen the theme concerning Hudson wives because I understand wives better than I understand cars, and I understand Hudson wives best of all. For 25 years I’ve heard these men talking about what a great club the HET Club is. It’s great because it has great members, it has great cars, it has a great magazine. But I’ll tell you why this club is great—it has great WOMEN. You all know that behind every restored car there is a woman-pushing! We’re great about putting dinner on the back of the stove and going out and pumping the brakes on the ’47. And we’re great about remember-ing the name of that little town in Indiana where we saw the ‘34 pickup and the name of the member in New Jersey who has the ’33. It’s not easy being the wife of an HET member. House cleaning alone is an adventure. Under the bed—bumpers for the ’36 convertible – and headlights for a ’29 Essex. In the linen closet – 2 boxes of spark plugs – a broken Hudson radio and parts for 2 more. On the pantry shelf – hubcaps from 3 pre-war cars (no 4 alike) and on every flat surface and empty space – Hudson models – and models that with a little remodeling could be Hudson models – radiator emblems – taillight lenses - door handles for an Essex – “notice the unique pine cone design” – every pencil, pen, cup, plate, and ashtray ever manufactured with a Hudson on it, plaques and memorabilia from 25 years of HET meets. On the wall there is always a Hudson calendar. So it’s not 1984 –what difference does the year make? In the garage -2 cars. None of my friends have a car in the garage, but a Hudson family has at least 2 cars in the garage - and these can’t be touched and nothing can be laid on them! And they aren’t even restored yet! We buy Hudson gas, use Hudson towels, and wear Hudson T-shirts. We cut clippings about everything even remotely pertaining to anything Hudson, with the exception of the Hudson River. We see every movie that has the slightest glimpse of a Hudson in it, even if it’s only the left taillight. We've had our picture taken beside more Hudson cars than we care to remember. We’ve attended HET Meets on our birthday, Mother’s Day, our anniversary (there’s never a Hudson meet on Father’s Day). We’re great at polishing the car after a 200-mile trip to the Meet. In fact if we arrive in Brand X, we don’t know what to do for the first two hours. And you can always tell the HET wives at the Flea Market. They’re the ones selling parts – while their husbands are out buying. We are great about identifying our husbands by the seat of their pants and the soles of their shoes. That’s all we’ve seen of them for 25 years! We’re great about packing three kids and a picnic basket into a ’33 Terraplane – with room left over for flea market parts! And we’re really great about food. Some of the best food in the world comes out of the trunk of a Hudson. You’re right. It IS a great club. It’s been a great 25 years. We’ve attended some great Meets. You men stand around and discuss the lettering on the hubcaps and the bore and stroke (more boring than stroking, if you ask me). We discuss how to prepare food that carries well to a Meet, how to live on our income and support a Hudson, how to raise children with a DIFFERENT hobby. Through the years we have seen these children grow, become parents, and bring their children and their Hudsons to the Meet. We always know who’s in the service and who's having a baby. It’s got to be a Great Club when you know as much about the kids as you do about the cars. It took 33 years, but they finally realized who keeps this club going. We thank the Yankee Chapter for choosing to honor the women of HET at the 33rd National. We appreciate the appreciation. I thought everyone would want to honor the ’33 Terraplane at the 33rd Meet. The ’33 Terraplane is a special car that everyone seems to love. It is speedy and sporty, steady and dependable, has great lines and is a good-looking car—and it set a lot of hill climb records in its day. But then I thought, we women are speedy and sporty, steady and dependable, have good lines and not bad looking. I had a little trouble with the hill climb record, but then I remembered the time I climbed that hill in the junk yard in North Georgia to see that old rusty Hudson, or maybe it was an old rusty Terraplane. I do know it was 95 degrees, and there were stick-tights and beggars-lice all the way to the top. Picking them off must have set some kind of record. But I have a word of encouragement for you women of HET. Eventually most of them outgrow it—or it outgrows them. No longer do they want to curl up under the dash, or crawl under the muffler, or bend over the motor. Some day he will no longer buy two of everything so that he always has repair parts for his Hudson. And better yet, no longer will he buy parts for cars he doesn’t own in hopes that some day he will. But he will always love his Hudson. He will not be impressed with new cars or new ideas. Meritt always says Hudson had the best of everything first—take air bags for instance. He says he has had an air bag on the passenger side of his Hudson for 50 years. I've discovered that Hudson husbands are usually happy husbands and the credit goes to Hudson wives; you are understanding, cooperative, and have a sense of humor. What’s a Nice Girl Like Me Doing in a Hudson Club? Once upon a time many years ago, about the time the earth’s crust cooled, I was a teenager in a rural area north of Pittsburgh, PA.
We were always hunting inexpensive entertainment. When we learned that the local skating rink would give an organization tickets for half price and resell them at the regular price for profit, we organized a group and sold tickets to each other for half price. But we still had the problem of transportation. The rink was 10 miles from where we lived, there were twenty of us and we had only one car among us—A Model A Ford. We were always looking for wheels. One day one of the boys told me he had someone he wanted me to meet. He lives over there on the hill, he’s a nice guy, he’s not bad looking. I think you’ll like him and by the way, he has a Terraplane. There was the zinger. How many skaters can a Terraplane carry? I knew what they were thinking, but I had read the classy magazines of the day and I had seen the ads for those long, low Terraplane convertibles usually parked outside the Country Club waiting for the dance to be over. I decided to go for it. The next time we went skating they introduced me to Meritt (we were standing by the drinking fountain and Meritt has told me many times since that he should have just taken a drink). Anyway, the Terraplane turned out to be his father’s ’36 Hudson 4-door (people couldn’t tell the difference back then either) and his car turned out to be a ’32 Essex without a license. But the guy himself turned out to be long and lean and good looking with a great sense of humor, so again I decided to go for it. He got a license for the Essex; we named it True Love because True Love never runs smoothly. We took crowds of kids to the skating rink, White Tower for hamburgers, and Isaly’s for ice cream. 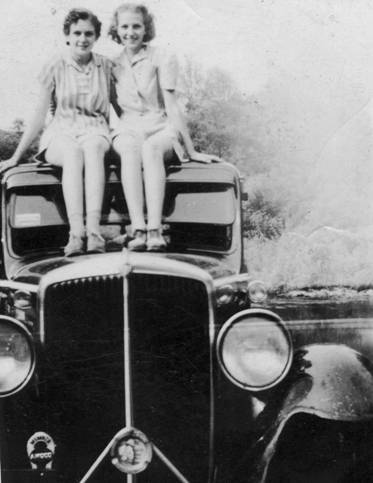 When we went to the swimming hole we hid his money and my jewelry in the hubcap of the ’32 Essex. Up until this time I hardly knew the Hudson Motor Company existed, but suddenly the road seemed full of Hudson products as Meritt pointed them all out to me. “See that yellow convertible with the wheels in the fenders?” “See that ’36 pickup?” “See the Essex that is just like the one I learned to drive on?” That was the beginning of the “See that” era, quickly followed by the “Did you know?” period. “Did you know that Hudson has double safe brakes?” “Did you know that the ’33 Terraplane still holds the hill climb record?” “”Did you know that a Hudson was the pace car at Indianapolis one year?” Etc., etc., etc. My first car was a 1942, straight eight, Hudson convertible. Dad found it for me, of course. I bought it for $75 just before my sixteenth birthday. It had been painted silver…with a paint brush. It needed some initial repair work, so we took it to a local garage. Mom and Dad surprised me by having it painted fire engine red for my birthday while it was in the shop. Later I added a new black top. It was a good looking car and attracted a lot of attention. People particularly liked the decorative parking lights on the fenders and lighted triangles on the hood, but it had one problem. The trunk was rusted through. Roy and I wedged a piece of rebar across the frame and under the bracket holding up the gas tank, to keep it from falling onto the pavement. Even as teenagers we knew sparks and gas tanks don't mix. I drove it to high school, and then put it aside in favor of a Hudson Hornet convertible, which I purchased with a blown motor, but that’s another story. I tried to sell the ‘42 for $95, but no takers. Dad sold it for $75 on the condition that he would tow it to Tennessee. I doubt I could get it back for $75. 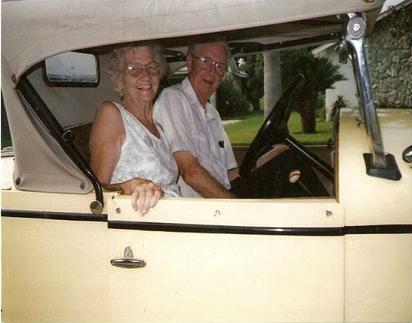 My first experience with Hudson was soon after I was born, riding home from the hospital in a cozy well-heated Hudson Eight. But I was told that later; I don't actually remember it. I do remember the first Hudson hornets chasing George and me from playing in our dad's '36 coupe parts car during WWII. Our mom fixed it all with medicine and hugs. I remember clearly at age four, being almost snowed in on the Pennsylvania Turnpike riding to Florida in my grandparents' 1940 Hudson Eight. The weather became beautiful after the mountains and the rest of the trip was great. I have fond memories of many Hudsons, driven by my grandparents, parents, brothers, sister, friends - plus the dozens and dozens I have owned of these smooth-lined, fast and cozy, people movers. How can I forget them? I have nine in the barn! H.E.T. holds a fond memory too: 50 Years - from helping with the first issue of the W.T.N. when I was a senior in high school to writing these memories today in 2009, I will always remember the people and the cars. In the early days of the HET Club a lot of people interested in Hudsons stopped by our house. Mom would visit with them until Dad came home from work, and somehow she always had enough food to share even if supper was already started. Some mornings we would wake up to find a young man or a couple young men sleeping in their Hudson. 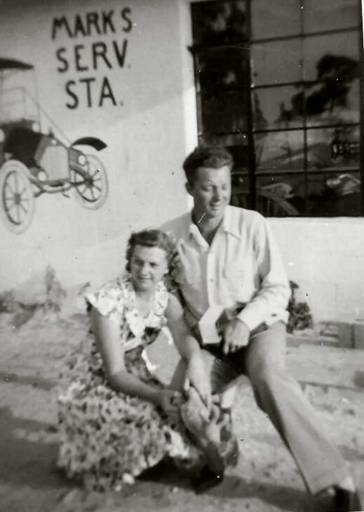 Mom and Dad would invite them in to freshen up, have breakfast, and visit for hours. 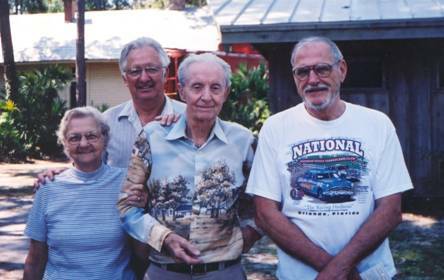 The whole family was involved in the birth of The Hudson Essex Terraplane Club. We copied, folded, stapled, and addressed the first newsletters. We had no idea that 50 years later the Club would be such a wonderful success and by that I don’t just mean people who love Hudsons, but people who care about each other like a family. I remember growing up in the Marks family; our life centered around the church and Hudsons. Because I was born well after the others I went to all of the first national meets. I have specific memories of Natural Bridge, the balcony, the gift shop, cars driving up the hill and some older kids who tricked me into taking a piece of gum that snapped my finger. I also remember towing dad’s ‘29 with his ‘54 because he was concerned there wouldn’t be enough cars. I remember other early meets including the Honor of being made member number 500. At home it seemed the mimeograph machine was always on the dining room table. Dad would write the bulletin and Mom would edit it. If that wasn’t there it was usually a carburetor being rebuilt. It became a family joke to clear off the table so we could eat. 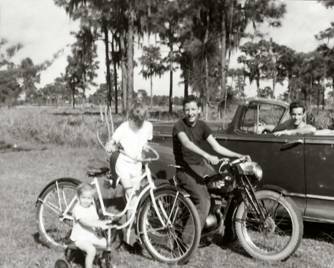 We lived in an open area long before Tampa Bay became a metropolis. Behind our back yard was a large palmetto field that allowed Dad to store over a dozen cars he saved from the junkyard. After they were stripped of all usable exterior parts, I was allowed to drive them in the woods until they stopped. Then Roy would take his ‘47 pickup and pull it out. Dad was a good-hearted man who just wanted to save Hudsons. That was his approach when he created the club. The unexpected side effect was a club of friendly people who care as much about the other guy’s car as they do their own. Choosing a family favorite whether children or cars is very difficult, often unfair and always unwise, so how can we choose our favorite from the dozen or so family cars we owned and loved? The ’32 Essex we dated in? The ’36 sedan in which we brought our first son home from the hospital? We finally chose the 1941 Commodore Eight Sedan. That beautiful black long wheelbase sedan was a comfortable and roomy car for a busy family of five. The armrest of the back seat made a wonderful seat for our daughter and left the window seats for her two older brothers. This was a real problem solver on long trips. That was our car as our children grew up and we really hated to part with it, but who could resist the ’47 convertible that replaced it? Let me tell you it is possible to live with a Hudson man. I've lived with one for over 50 years and I survived. Of course I didn't know he was a Hudson man before we were married. When the minister declared us Hudson and wife, I knew I was in trouble. I will always say a few words. Although after 31 years what can be left to say? Yet I walked through the parking lot and I saw these groups standing around, one man talking and twelve men listening—I guess it hasn't all been said. The theme for this meet is “The War Years,” I don't know which War Years they are referring to. 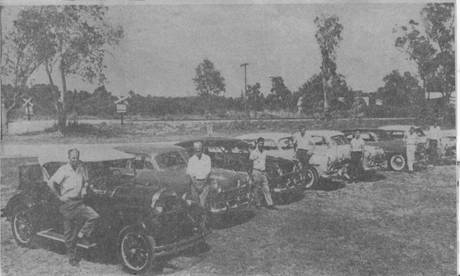 It could have been the year Meritt brought home the 13th Hudson—or the year he sold the '54 hardtop, my favorite car. Or the year he took the best room in the house for his club room—or maybe this year (1990) when he said, “Sure, we'll put out the chapter newsletter.” I don't know about your house, but at our house the war goes on. An HET owner never really sells his cars—at least he never completely relinquishes ownership. For years afterwards he will see the ex-car across the lot at a Meet and exclaim excitedly, “There’s my ’36” (or whatever) usually followed by “I never should have sold that car.” And the same applies to other’s cars (i.e., there's Meritt's '29 Essex) at least until everyone becomes familiar with the new family relationship. 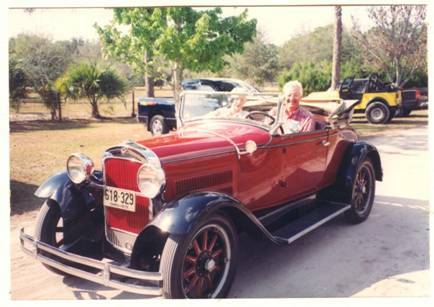 With that in mind, below is a picture of Meritt in his 1929 Essex (Roy is driving). He was thrilled to be in his car again, thanks to Peter Macey for driving it to Pratt’s Meet. The picture was taken in February 2003, Dad died in the fall. Dad was born and raised in the Pittsburgh area and he wanted so much to attend the National Meet held there in 2004. Although he was hospitalized for months, he never complained. He believed he was going to a far better place with Streets of Gold (and no doubt Hudsons on the road); he died just months before the Meet. 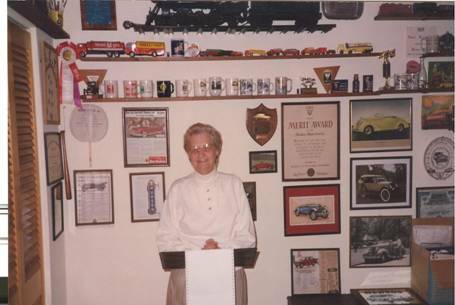 Mom often talked about attending this Meet in Detroit. She wanted very much to be here; she fought a heroic battle against many illnesses, but she died in January of this year. This booklet was created as a tribute to our parents, and in a sense our parents are here at this very special Hudson National Meet.